My night blooming cereus has SEVEN flower buds on it! I am very excited. I have had this plant forever, and it has bloomed twice, with just one flower each time. Now, suddenly, it has seven flower buds on it. SEVEN! I don't know if all seven buds will mature to the point of flowering, nor do I know when the big night will be. I will just have to watch these buds and see what happens. Then one night, it will just bloom, or maybe the blooms will occur over several nights. But the blooms will last just one night each, so I must be home the night they bloom or I will miss the flowers. When these flowers bloom, it will be a MAJOR GARDENING EVENT of this season. A not-to-be-missed event. 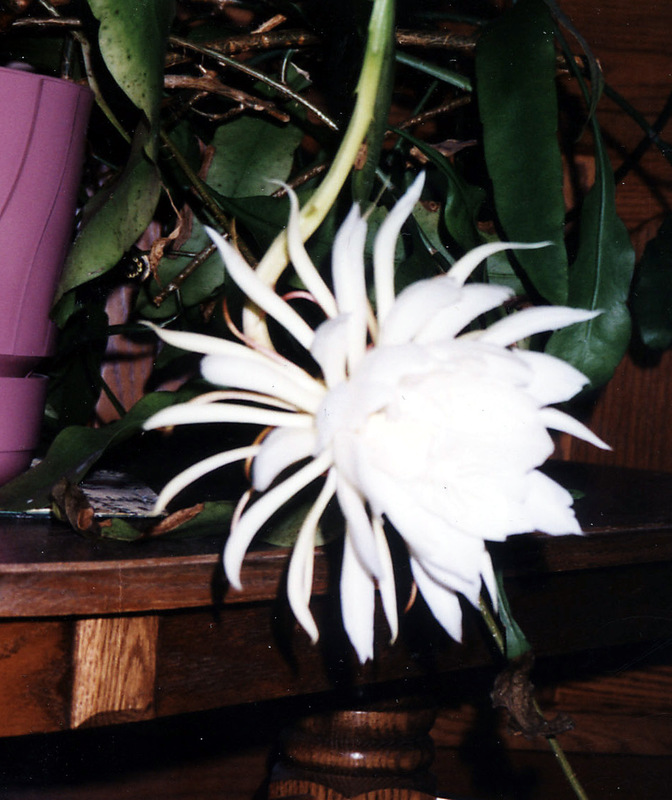 When the night blooming cereus plant was ready to bloom the first time, I had to go out of town for work for one night. I was not sure if I would miss the bloom, but did ask my boss if anyone had ever rescheduled something because of a "horticultural event" like this and he said no. I didn't press him, went out of town, rushed home the next day, and found that it had not yet bloomed. It waited and bloomed for me the next night! I didn't take pictures that time. The next year when it bloomed, I took some pictures (see below). That was 5 years ago. This year when it blooms I will take a lot of pictures, especially if I have multiple flowers blooming on the same night. Right now the flower buds are about 1/2" long. If I recall correctly they will be close to 3 inches or longer before they bloom. I have some waiting to do, but THIS WILL BE WORTH THE WAIT! You should consider having an open house on the big night! Since the kids are studying botany right now, can they come over and witness this spectacular event whenever it may be, even if you don't have an openhouse? Sounds like a perfect garden party opportunity to me. Keep us posted on expected date and post one of your pictures of past blooming if you can. I remember the trip out of town!